Take a look at your desk. Is it cluttered with pens? Wires hanging tangled up everywhere? Electronic devices hiding under piles of papers? 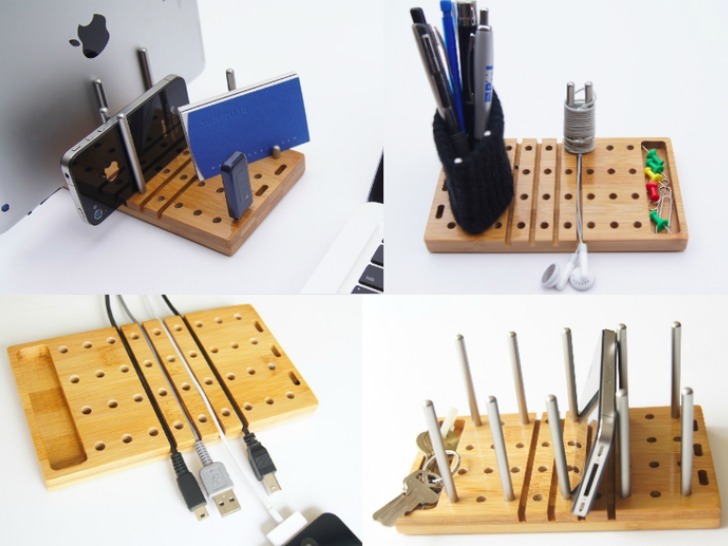 B&A Studio in Houston, TX has created an awesome modular desktop organizer to neatly hold anything and everything, including USB flash drives and your dangling wires. Dubbed Modo, the design looks like those peg board puzzles and it works similarly too. Modo is made of bamboo and comes with aluminum pegs (16 long and 4 short) that can be placed in any hole to hold different sized items from business cards to iPads. B&A Studio has launched an already successful Kickstarter to get Modo manufactured and there’s still time to get your hands on one for a pledge of $26. Though they’ve already reached their goal, they’ve been adding on new upgrades, including protective capacitive caps that turn any of the pegs into a stylus your electronic devices. With 24 days left in their campaign, who knows what they’ll come up with next. Make a pledge for your set now! Thanks a lot for the exposure Alyssa :-) We are very excited about the opportunity to bring Modo to life :-). Enjoy your day. Take a look at your desk. Is it cluttered with pens? Wires hanging tangled up everywhere? Electronic devices hiding under piles of papers? B&A Studio in Houston, TX has created an awesome modular desktop organizer to neatly hold anything and everything, including USB flash drives and your dangling wires. Dubbed Modo, the design looks like those peg board puzzles and it works similarly too. Modo is made of bamboo and comes with aluminum pegs (16 long and 4 short) that can be placed in any hole to hold different sized items from business cards to iPads. B&A Studio has launched an already successful Kickstarter to get Modo manufactured and there's still time to get your hands on one for a pledge of $26. Though they've already reached their goal, they've been adding on new upgrades, including protective capacitive caps that turn any of the pegs into a stylus your electronic devices. With 24 days left in their campaign, who knows what they'll come up with next. Make a pledge for your set now!